We were warned, and now eight years after overthrowing Moammar Gaddafi, the country is being torn to shreds. Eight years after the start of the U.S.-led military intervention to overthrow Moammar Gaddafi and promote “stability,” Libya is still wracked by civil war. Ironically, the violence over the next few days has forced the U.S. to evacuate its remaining forces—there for diplomatic security and counterterrorism—from the volatile country. Ever since the collapse of the old regime and Gaddafi’s violent death in 2011, Libya has been split among rival militias, and since 2014 it has had two would-be national governments. The government based in Tripoli now enjoys international recognition and some Western support, while the government in the eastern Libyan city of Tobruk has benefited from the support of Egypt, the Saudis, and the United Arab Emirates. The leader of the Tobruk government’s forces, Khalifa Haftar, is a former exile (at one point in the U.S., reportedly backed by, and maintaining ties to the CIA) who returned to Libya during the 2011 war and served as the head of the new army under the first post-Gaddafi government. Haftar broke with them in 2014, and he has been engaged in a fight to take control of eastern Libya and to oppose the government in Tripoli ever since. Over the last few months, his forces have seized the oil fields in the south of the country. Libya’s long-running civil war escalated sharply in the last week as Haftar launched a surprise offensive against Tripoli in an attempt to seize the national capital. His aggressive move has been met with widespread condemnation, from the U.N., the U.S., and the EU, and it has driven the rival western militias to band together in opposition to him. A military offensive by a Libyan warlord against the country’s capital has done what years of negotiations and talks have failed to do – unite the country’s powerful western militias in an all-out effort to defend Tripoli. Already at least 41 people have been killed and dozens more injured in clashes inside and outside of the capital, as the UN and EU struggled to put an end to the conflict that has pitted the country’s two main armed alliances against each other for control of the city of 1.2 million. Security conditions in the country have deteriorated so quickly over the last few weeks that American forces based in western Libya were evacuated at the start of the week. The U.S. is currently fighting one of its many unauthorized wars in Libya, and it has cooperated with the Tripoli government against the local ISIS affiliate for the last several years. The U.S. has so far not joined the fighting against Haftar’s forces. The Trump administration has publicly criticized the new offensive and called on Haftar to halt the attack, but it is doubtful that the U.S. will do anything more than that. By mobilizing and uniting most forces in western Libya against him, Haftar’s attack on Tripoli has totally transformed the balance of forces in Libya. He wanted to grab it all; now he faces the real possibility that he might lose most (even all) of what he had before the attack. Whatever the outcome of the latest battle, the continuation of the war is certain to deepen the misery of Libya’s civilian population. 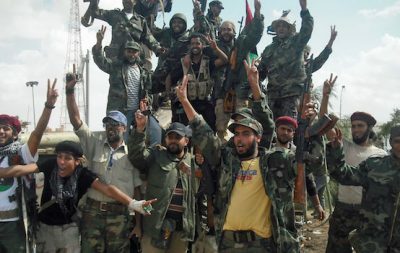 Eight years later, Libya is still living with the instability and violence that resulted from U.S.-backed regime change made possible by Western intervention. Like many other such interventions, the Libyan war has left behind a legacy of upheaval and destruction. The civilians that supposedly benefited will be living with the consequences for years and probably decades to come. Daniel Larison is a senior editor at The American Conservative.